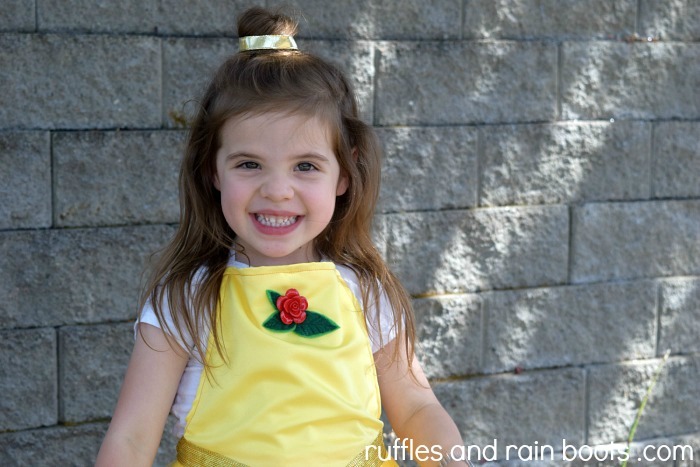 This DIY Princess Belle Dress Up costume, inspired by Disney’s Beauty and the Beast, is quick to make using just a few supplies. We’ve made many dress up costumes and share our proven beginner sewing tutorials will walk you through it step-by-step. If she wasn’t my only, she’d definitely be my favorite. I can sew in a straight-ish line. I have to look up a video EVERY TIME I need to sew on a button. I have more holes in my fingers than a sieve when I attempt to hand sew anything. Now, I’m not telling you all that to embarrass myself. I’m stating it here because if you have a sewing machine, a needle, and some thread, YOU CAN MAKE THIS. Promise. My entire craft store bill for this Belle dress up apron was a whopping $23 (we already had the $3 apron) and if I would do it again, I would make the roses from felt. That would bring the total down to about $19 (including the apron). That makes this a fun and frugal craft for Halloween or dress up. First, cut the bodice from the satin using this free princess template (see note above). Skirt piece – 25 inches wide by 18.5 inches high (these dimensions work for 3-6-year-olds but if this is for an older child, measure the length). Tulle – I cut the width – doubled over, just like it comes on the spool – by 21 inches. Again, if this is for an older child, measure the length. You’re going to gather it at the bottom, so keep that in mind. Next, you’ll start assembling the skirt. Double hem the satin skirt piece, making it about 23.5 x 17.5-inches. This eliminates fraying. Pin the tulle to the skirt piece, alternating 1.5-inch pleats with every layer of tulle (I folded my sheets so each sheet had two layers of tulle). 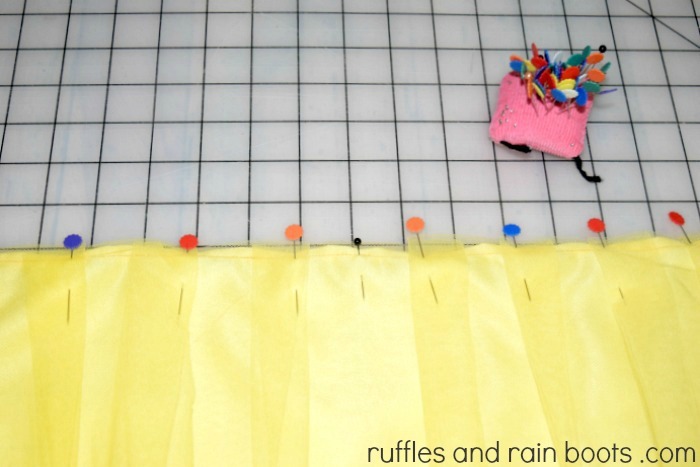 Sew tulle to skirt piece. Now, sew the ribbon (in two sections) to the bodice. Overlap one to make it look finished. Sew bodice to the apron (just tuck the satin under and pull it around the back). 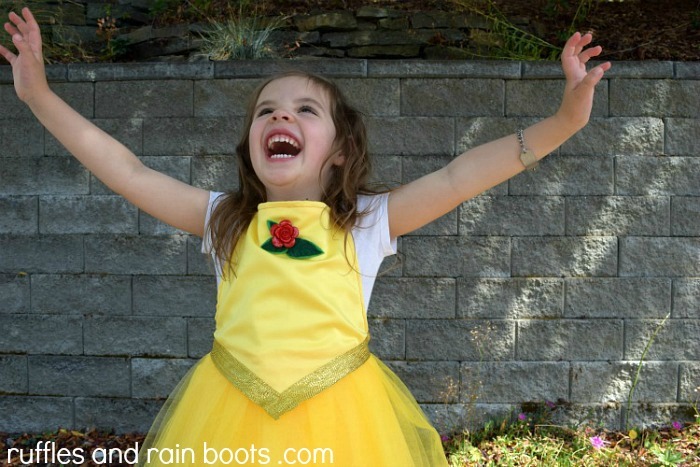 Next, it’s all about the details for our Princess Belle dress up costume… You can choose to hand- or machine-sew the veins on the felt leaves. If I had to do it again, I would have just done it for the three leaves on the bodice. Hand-sew the gathers in the tulle skirt piece and secure the end gathers to the other layers of tulle. First, identify where your top layer of gathers will be. 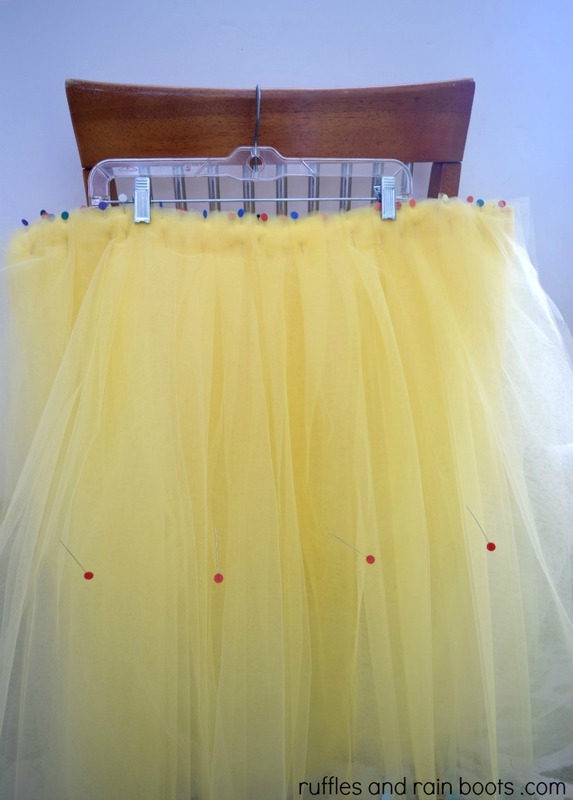 To sew a gather, just start at the bottom of the layer of tulle and thread a needle and thread in-and-out going up. Once you’ve reached your marker point, just pull the thread gently and tie off around the gathered section. Secure with a couple of knots and cut the thread. Note: I made three layers of gathers and left the remaining layers straight. It was easier and I didn’t have to worry about little ones tripping on a gather. Hand-sew on the smaller flowers and leaves on top of the gathered section to accent the gathers. 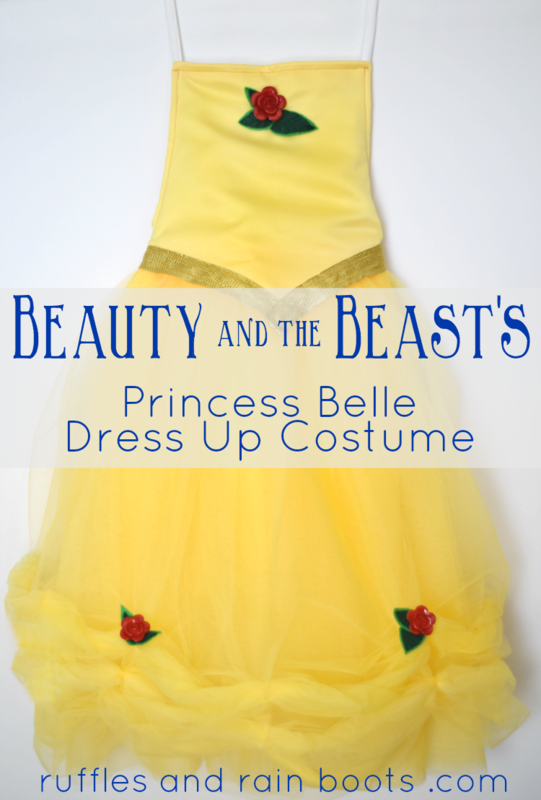 This DIY Princess Belle Dress Up costume, inspired by Disney's Beauty and the Beast, is quick to make using just a few supplies. Skirt piece - 25 inches wide by 18.5 inches high (these dimensions work for 3-6-year-olds but if this is for an older child, measure the length). Tulle - I cut the width - doubled over, just like it comes on the spool - by 21 inches. Again, if this is for an older child, measure the length. You're going to gather it at the bottom, so keep that in mind. Next, you'll start assembling the skirt. Double hem the satin skirt piece, making it about 23.5 x 17.5-inches. This eliminates fraying. 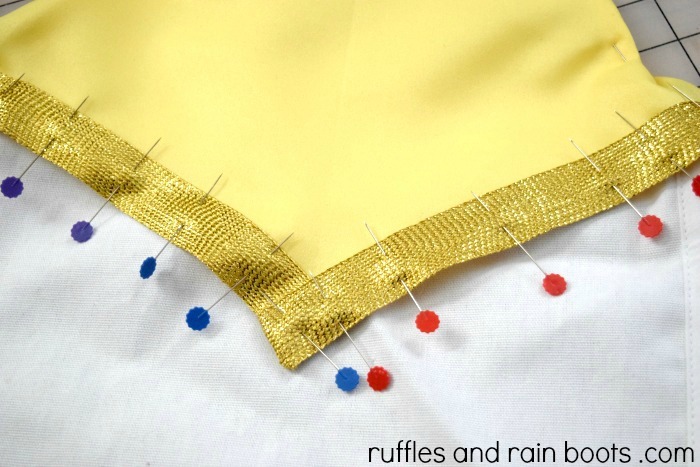 Next, it's all about the details for our Princess Belle dress up costume... You can choose to hand- or machine-sew the veins on the felt leaves. If I had to do it again, I would have just done it for the three leaves on the bodice. To sew a gather, just start at the bottom of the layer of tulle and thread a needle and thread in-and-out going up. Once you've reached your marker point, just pull the thread gently and tie off around the gathered section. Secure with a couple of knots and cut the thread. Note: I made three layers of gathers and left the remaining layers straight. It was easier and I didn't have to worry about little ones tripping on a gather. A big tip I have is to keep in mind that tulle is forgiving. 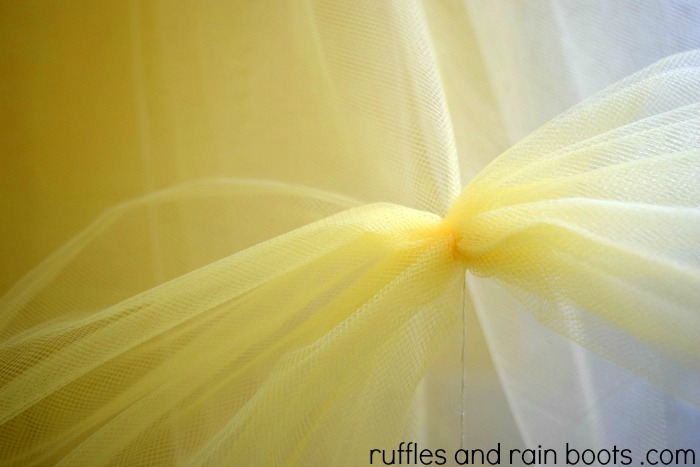 Nothing really needs to be exact when working with tulle (which is why I work with it). Don’t fret and ALWAYS have a dryer sheet handy (or something that controls static). 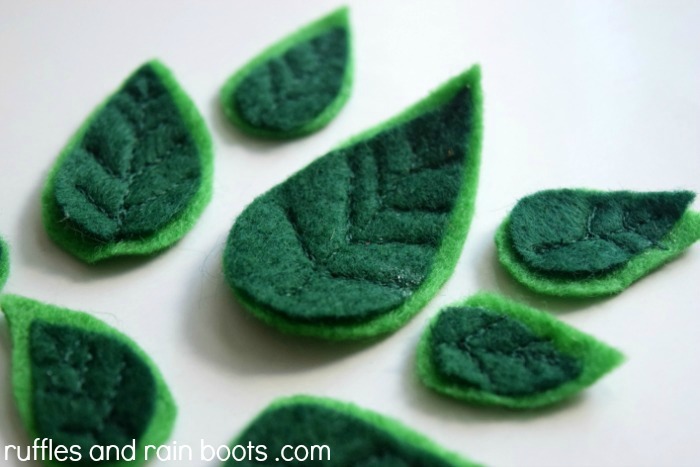 To keep costs down, make your own roses from felt. Y’all, to be honest, I was too lazy and bought buttons at JoAnns that most resembled a rose. I’m the world’s laziest crafter, I know. You will have material left over in case you want to whip up a quick Halloween Trick-or-Treat bag or a purse. For every dress-up outfit I make, the little one gets a matching handbag – I’m a sucker. 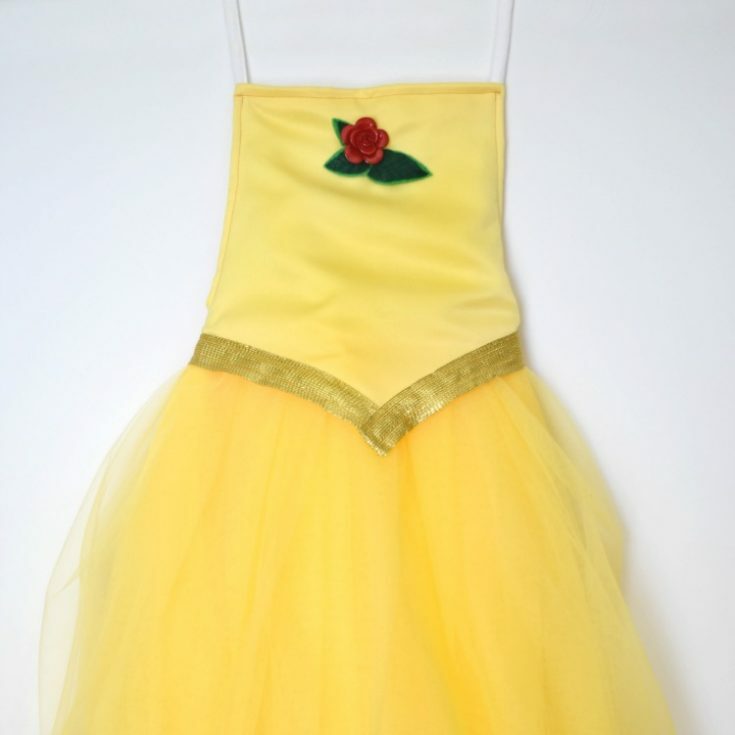 You’d be the mother (grandmother, auntie, care-giver) extraordinaire if you made this Princess Belle Dress Up Costume for a little one in your life. And if you have any questions, ask them in the comments! Would you please pin this to your favorite dress-up or Halloween costumes board? This one and your girl is adorable! Can I tell you again how I wish we were neighbors? I would bring you dinners and yummy treats all of the time if you could sew an apron or two for my kiddos every once in a while. Yes, definitely inexpensive to make (which is why I keep making them)! :) And honestly, I have no idea what I’m doing with sewing, so it’s perfect for us newbies, too. Let me know if you make it for your niece! Oh, how the little ones are still so in love with Elsa. :) Elise still has the love for the polar princess, too. 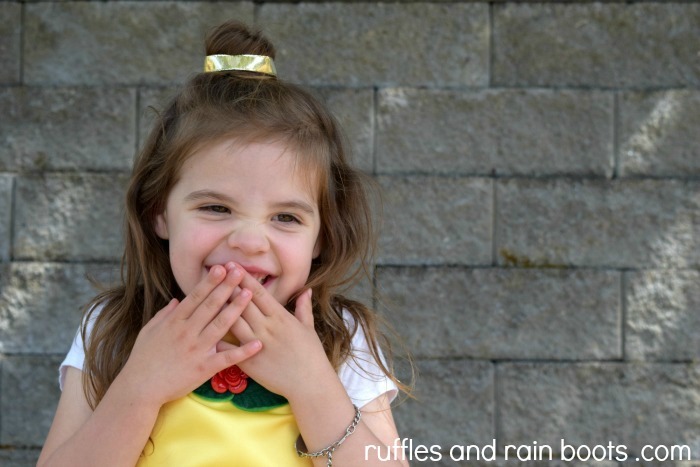 You should make her the little Elsa apron (it’s even easier than this one)! Isn’t it crazy how big they’re getting? !